Pro Mujer in Nicaragua is celebrating its 17th anniversary this month after starting operations on July 31st 1996 thanks to the dream of their cofounders, Lynne Patterson and Carmen Velasco. Today, Pro Mujer in Nicaragua helps almost 53 thousand women throughout the country, and because of their effort and their will to improving their lives, the organization is the second largest in Nicaragua from the ones registered in the Asociación Nicaragüense de Instituciones de Micro Finanzas (ASOMIF). In Latin America holds the second place regarding portfolio quality. To mark the celebration of its 17th anniversary, three operation centers were inaugurated, following the poverty map. In April a new center started giving opportunities to women in Jinotepe and two new offices where opened, one in Jinotepe and another in Malpaisillo. 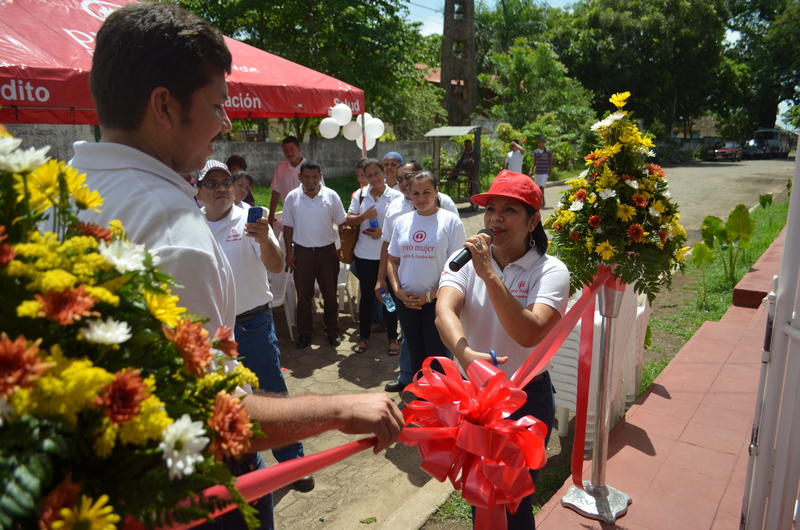 Gloria Ruiz cutting the ribbon during the launching of the anniversay events. “We are bringing our clients closer to the Integrated Credit, Training and Health Services. The largest impact from Pro Mujer in women development is what the statistics say. In the last ten years we have prevented death from cervical cancer and breast cancer in more than three thousand women. Three thousand women today can tell their shocking testimony” said Gloria Ruiz, General Manger of Pro Mujer and who is also celebrating 17 years of working in the organization. In the last years, thanks to the integrated health and education services, the 53,000 clients and their families can have good health, manage their business, make their own decisions and definitely improve the quality of their lives thanks to the almost 190,000 trainings that Pro Mujer has conducted so far in areas such as financial education, self-esteem and health. During the 17th anniversary and to award the clients’ loyalty, Pro Mujer launched two new products. One of them is the Vida Sana health package, which started as a trial in the city of León and is now starting in Masaya. Client getting a “Vida Sana” health service package. “Vida Sana is a health services package that works with an annual membership, and it can be purchased by Pro Mujer clients, in order to timely detect some diseases and restore and maintain health status of our clients and their family,” added Gloria Ruiz. 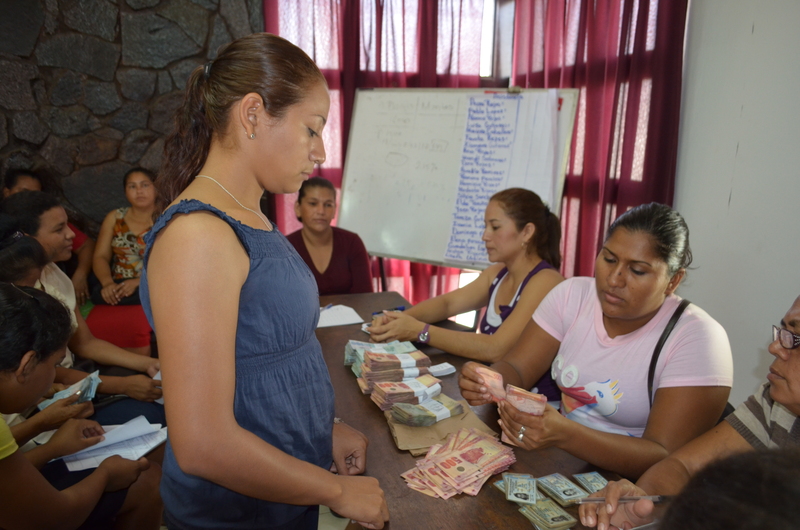 Another innovative product for the clients is the Individual Credit program currently running in León and Chinandega, which Pro Mujer in Nicaragua wants to spread to the rest of the departments where the organization operates. This product is for clients and former graduated clients that worked under the communal bank methodology. “This is an opportunity for our clients to develop their financial activity. With the Individual Credit program a client can request up to $2,000 USD, and from $2,001 up to $8,000 USD with two sureties,” says Gloria Ruiz. By the end of 2013, Pro Mujer in Nicaragua will expand its operations to other areas of the country providing live changing opportunities to many more women.